Muhurta, or choice of an auspicious moment for commencement of an activity used to be the most important branch of Astrology in ancient times. Reasons for this can be found in its emphasis on the positive aspects of life, i.e., choosing a favorable time to commence any activity. The emphasis on 'Karma' or effort to create a short term destiny relating to a particular aspect of life within the limits set by major destiny or birth horoscope has also been the reason for giving muhurta the importance it deserved. In this book an attempt has been made to present the information relating to this branch of Astrology in a systematic manner. The book is written keeping in mind the following objectives. (1) To present all relevant information about muhurta in an organized and simple manner. The target reader of this book is a student of astrology and not a scholar. (2) To give relative importance of different variables to be taken in to account for fixing a muhurta. This will help the reader in making right choice. (3) To introduce certain new areas, which are very important but are generally ignored while fixing muhurta. In this book an attempt has been made to explain the use and importance of Ashtakavarga, dasha and Tajik yogas in muhurta by giving examples. (4) To Help the reader in choosing a muhurta in situations where he cannot consider all the factors due to urgency. How far we have been successful in our attempt is for the readers to decide. This book contains an elaborate discussion of components of muhurta, benefic and malefic yogas, benefic and malefic transit positions, all 'Sodasha samskaras' or sixteen sacreaments, educational and occupational muhurtas, muhurtas relating to construction, juourney, coronation and other muhurtas related to almost all aspects of life. Tables have been used in abundance to put the information in simple and understandable manner. Although we have tried our best to present the book in simple and understandable manner, yet certain imperfections & errors are bound to be there. For that, we welcome any suggestion from our readers which can help in future improvements. 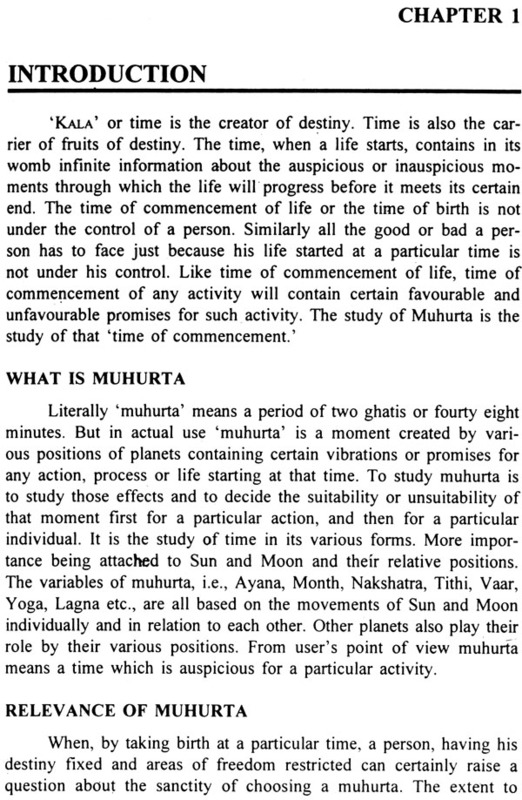 Literally 'muhurta' means a period of two ghatis or fourty eight minutes. But in actual use 'muhurta' is a moment created by various positions of planets containing certain vibrations or promises for any action, process or life starting at that time. To study muhurta is to study those effects and to decide the suitability or unsuitability of that moment first for a particular action, and then for a particular individual. It is the study of time in its various forms. 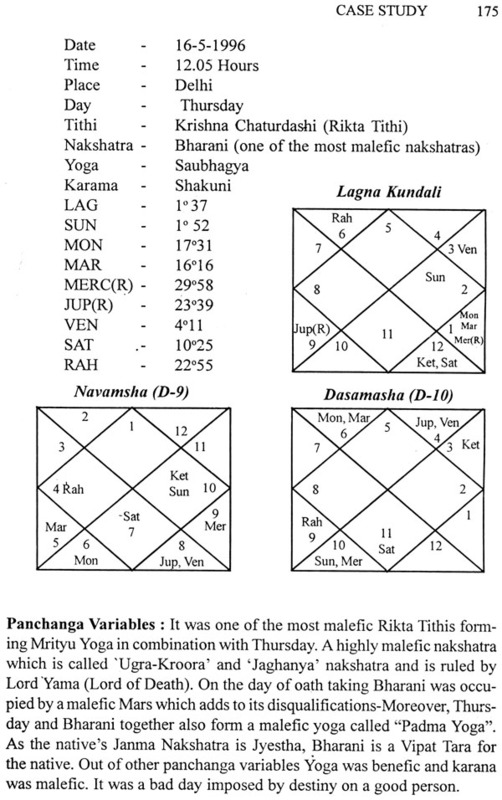 More importance being attached to sun and moon and their relative positions. 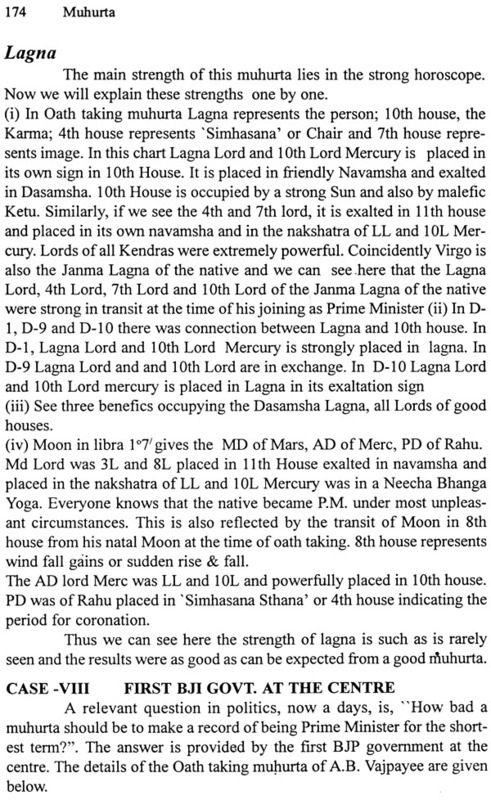 The variables of muhurta, i.e., Ayana, Month, Nakshatra, Tithi, Vaar, Yoga, Lagna etc., are all based on the movements of Sun and Moon individually and in relation to each other. Other planets also play their role by their various positions. From user's point of view muhurta means a time which is auspicious for a particular activity. When, by taking birth at a particular time, a person, having his destiny fixed and areas of freedom restricted can certainly raise a question about the sanctity of choosing a muhurta. The extent to which choice of a proper time for commencement of an act is in the control of an individual is a point of debate. 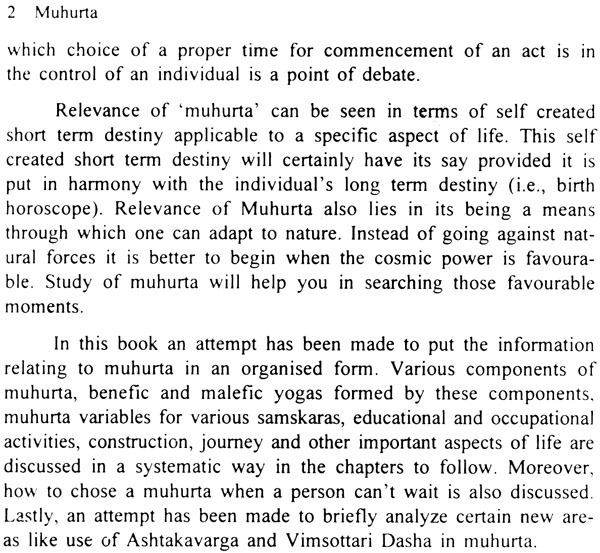 Relevance of 'muhurta' can be seen in terms of self-created short-term destiny applicable to a specific aspect of life. This self-created short-term destiny will certainly have its say provided it is put it harmony with the individual's long-term destiny (i.e. birth horoscope). Relevance of Muhurta also lies in its being a means through which one can adapt to nature. Instead of going against natural forces it is better to begin when the cosmic power is favourable. Study of muhurta will help you in searching those favorable moments. 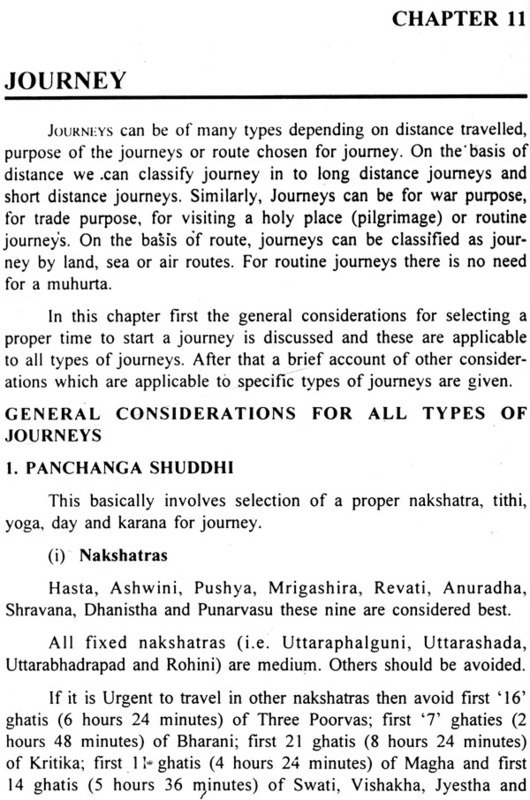 In this book an attempt has been made to put the information relating to muhurta in an organized form. Various components of muhurta, benefic and malefic yogas formed by these components, muhurta variables for various samskaras, educational and occupational activities, construction, journey and other important aspects of life are discussed in a systematic way in the chapters to follow. Moreover, how to chose a muhurta when a person can't wait is also discussed. Lastly, an attempt has been made to briefly analyze certain new areas like use of Ashtakavarga and Vimsottari Dasha in muhurta. 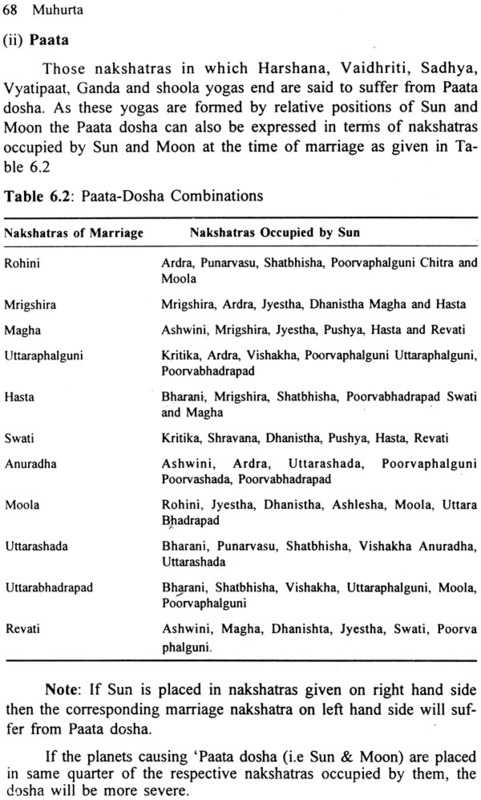 Tithi, Classification of tithes, Tithi Kshaya, Tithi Vriddhi, Paksha Randhra tithis, Tithi Gandanta, Lord of Tithis, Nature of tithes, Parva Tithis, Galgraha Tithis, Anadhyaya, Pradosha, Manuadi and Yugadi tithes, Nakshatra, Abhijit nakshatra, Classification of nakshatras, Other details regarding nakshatras, Tara, Nakshatra Gandanta, Day or Vaar, Hora, Yoga, Karana, Bhadra, Bhadra Nivasa, Bhadra-mukha-puchha, Month, Kshaya, Masa, Adhika Masa, Uttarayana and Dakshinayana, Ascendant. 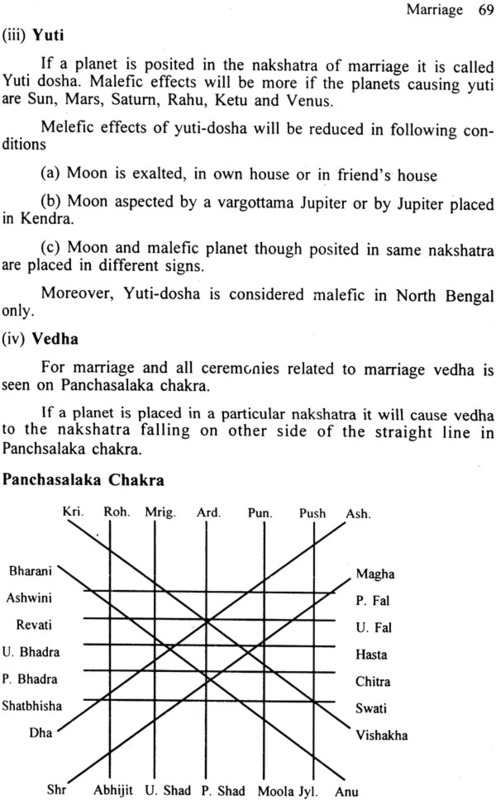 Benefic transit positions and vedha positions of Sun, Benefic transit and vedha positions of Moon, Benefic transit and vedha positions of Mars, Saturn, Rahu, Ketu, Benefic transit and vedha positions of Mercury, Benefic transit and vedha positions of Jupiter, Benefic transit and vedha positions of Venus. 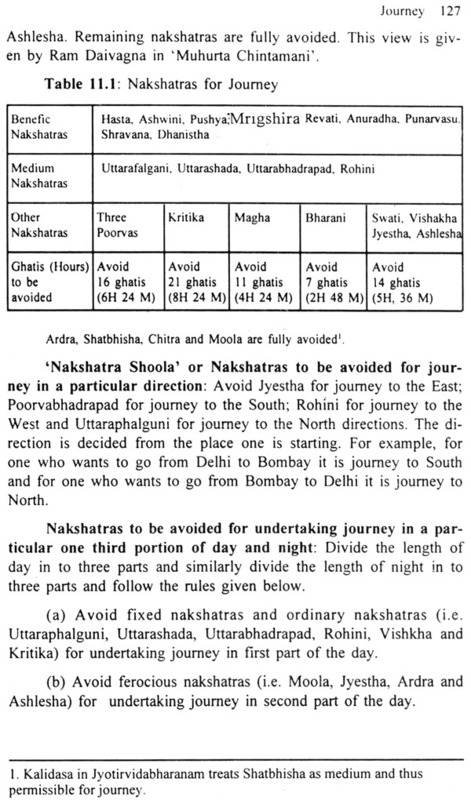 General considerations for all types of journeys, Nakshatras for journey, Nakshatra-Shoola, Tithi, Karana, Day for journey, Vaar-Shoola, Yoga, malefic combinations, Chandra-Nivasa, Sammukha-Shukra, Prigha-Danda, Yogini-Nivasa, Considering Rahu in journey, Kaala-Pasha consideration, Ayana consideration, considerations specific to an individual, Lagna for journey, Which factors are to be given importance, Considerations for specific types of journeys, Journey for wars, Disputes etc., Kalu-Akula-Kulakula nakshatras, Tithis and days, Combinations for victory of attacker or plaintiff in muhurta lagna, Prasthana or symbolic start of journey.